Fish curry made with special freshly roasted grounded spices. This curry is different from the other curry as in this I have added all the spices which is needed for fish curry and also tamarind and mango pieces. So this curry is sour, tangy and spicy. In this I have chopped the onion and tomatoes very finely and added , if you want can add paste of onion, tomato and garlic as I did for the fish mango curry in my previous recipe, can add fresh grated coconut also. There are varieties of fish curry which I will be sharing with you, as in my house and my relations house the fish curry I tasted was always not the same. I will share all the recipes with you which I know. 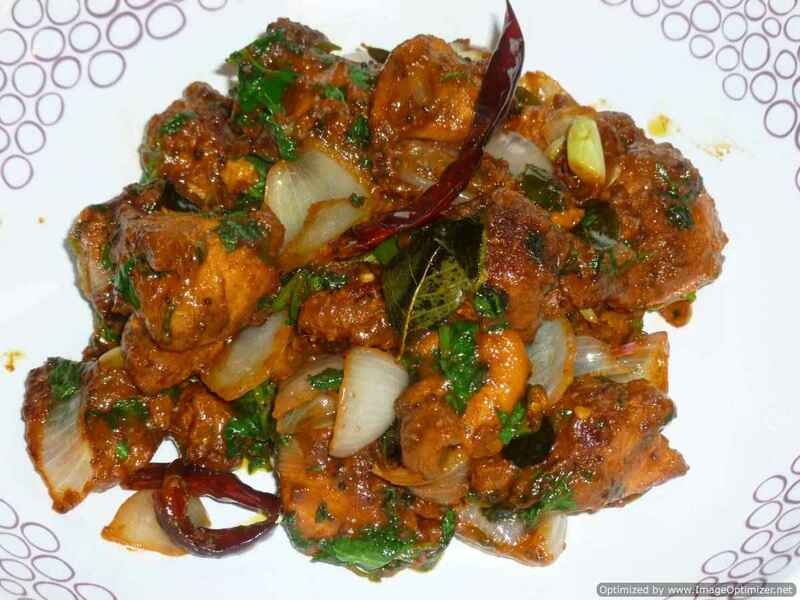 Fish is liked by every one and you can use any fish you like for this curry like cuttla (in telugu), sea bass (koduva in tamil), king fish (vangaram in tamil), tilapia, and other fishes which you like and it is available to you. Though I have prepared this fish curry in southern style but I have made according to my taste and added all the spices which I want to try. First slice the fish into medium size slices and wash it properly. Keep it aside. I have chopped the onions and tomatoes very finally, if you want can grind it into a fine paste. Cut the mango pieces into chunks, can cut without skin or with skin also. Roast all the spices on the medium flame till aroma come, you can see that curry leaves becomes crispy and other spices are lightly brown. Cool it and ground it into a fine powder. 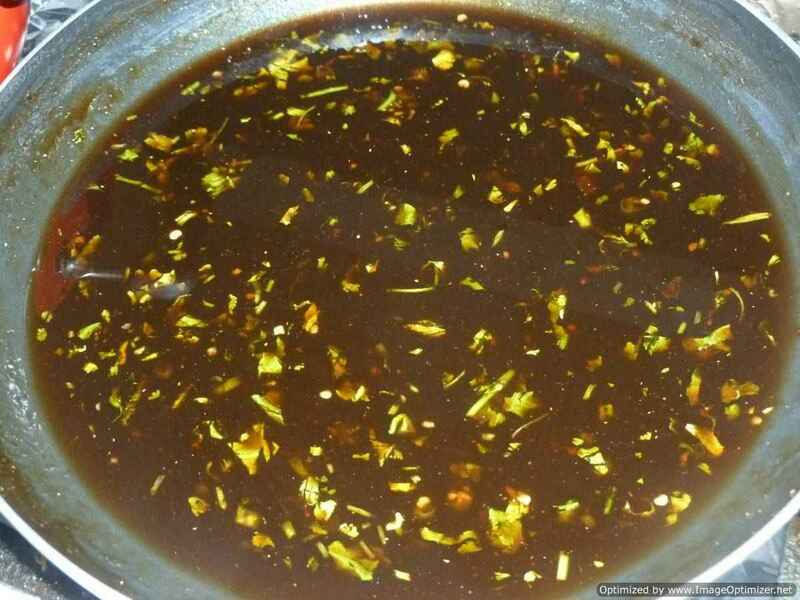 Now take a wider vessel, add oil, when it gets hot, add mustard seeds, cumin seeds, curry leaves, dry chillies, roast for few seconds till it splutters, then add methi seeds. After 15sec add chopped onion, garlic and cook till it is lightly brown. Now add chopped tomatoes and mix well, after 1-2 min, add chilli powder, coriander powder, turmeric powder, mix well and let it roast for 1min, do not let the spices burn. Now add water 1/2cup, so that the spices are cooked well. When the water is absorbed, you can see that garlic is soft and tomatoes are well blended with the onions. Now add water again 11/2 cup water, tamarind paste, salt, mix well, and place all the fish’s pieces carefully. After adding the fish pieces, add the slit green chillies and mango pieces, stir it carefully and close the lid and cook the fish till it is cooked on medium flame 12-15min. After 15min, you can see that the fish is cooked, now add the grounded spice powder on the fish curry and try to mix it well in the fish curry not with the help of a spoon, but just rotate the vessel clock wise carefully and slowly by closing the lid. When the fish is added in the curry, we should not stir it with a spoon but, it should be mixed by just shaking the vessel slowly. Close the lid and simmer it for 8 to 10min and switch it off. You can see in the picture that fish is cooked well and the mango pieces have become very soft and curry has left oil on top. Serve it with plain rice, dosa or idli or roti (chapathi). 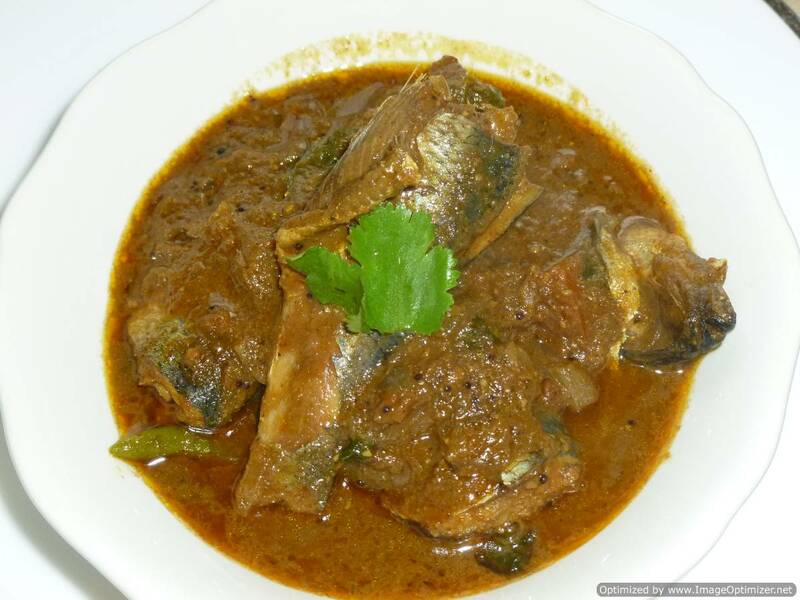 The fish curry always taste best the next day as tamarind is added. The curry in which tamarind is added, it tastes good the next day. Add water according to the curry you need. You can grind onion(2), tomato (2)and grated coconut(1/3rd cup) and make a paste with little water, and add the above spices and cook like a gravy, it also gives different taste. You can avoid mango in the curry, but need to add little more tamarind according to your taste. Always keep the remaining fish curry made with tamarind, it tastes good the next day , we always have it in the breakfast with plain dosa, only the curry (sauce), we are not bothered to have the fish also. If you want can add cumin powder (1tsp) also.